So many friends of the CREW Land & Water Trust love Bird Rookery Swamp and head there on a regular basis for wildlife viewing. The number one, top-of-the-list animal they are there to see? For first-time visitors, seeing an alligator seems thrilling and exciting until they almost step on one along the tram/trail or have the unfortunate luck to have their path blocked by a sunning gator. In response to a few calls we’ve received over the last few weeks, we’ve compiled some answers to frequently asked alligator questions. 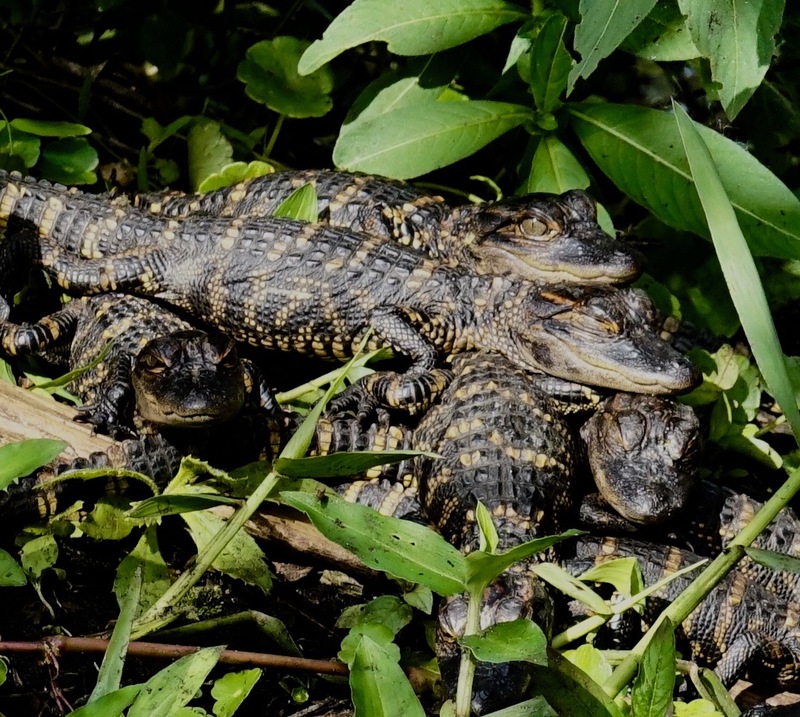 Why are there so many alligators at Bird Rookery Swamp? Bird Rookery Swamp is prime amazing fantastic Grade-A alligator habitat. It’s like an alligator gated community. Some of the neighbors keep to themselves, some live in the way back where it’s pretty private, and others like to walk around in their front yards and yell about HOA regulations. Well, maybe not that last part, but you get the idea. The CREW Project is 60,000-acres and is first and foremost land preserved for water, and second land preserved for wildlife. And Bird Rookery Swamp does a great job holding water and housing alligators. Who then meet up with other alligators and, well – you know the rest. Why don’t you have rangers there to warn people about the alligators? The CREW Land & Water Trust is a nonprofit conservation organization that is part of the greater CREW Project. We provide environmental education at the three (soon to be four) trail systems within the CREW Project. What isn’t in that sentence? We – the CREW Trust- do not own the land. There is no fee to access the public lands that are owned and managed by South Florida Water Management District. So, no rangers. We do have FWC law enforcement that patrol within the 60,000-acre project. But, again, no paid rangers. We do have volunteers who are on the trails during programs and as trail stewards, but with around 40-volunteers, we do not have someone permanently stationed at Bird Rookery Swamp to inform folks about alligators. Where can I find information about the alligators at Bird Rookery Swamp? In the parking lot. At the kiosk. At the second kiosk at the end of the shell path before you turn onto the boardwalk. At the talking trail post on the boardwalk. AND at the end of the boardwalk before you step down onto the grassy tram. Florida Fish and Wildlife Conservation Commission, South Florida Water Management District and the CREW Trust have multiple signs, starting in the parking lot, that offer information about alligators and what to do when in their presence. What should I do if an alligator is laying on the path and blocking my way? If that doesn’t work, and it probably won’t even if the alligator is named Susan, you have to either turn around and go back the way you came or have a seat and wait. (This is a good time to remind you to pack water and snacks if you go to Bird Rookery Swamp). 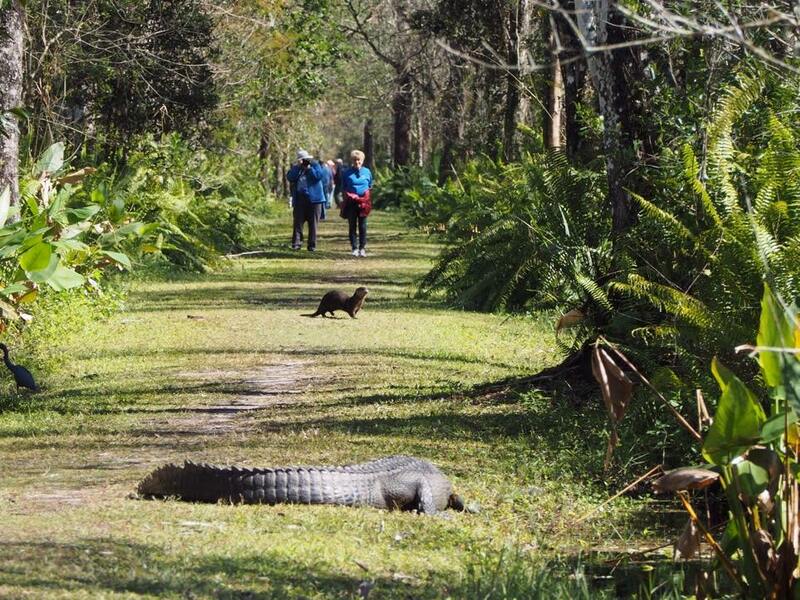 Because of how the Bird Rookery Swamp trail is shaped – a number 9 – there really is only one way out and one way in, so an alligator sunning itself across the tram can create quite a long day for a group of hikers. You cannot throw rocks at the alligator or poke it with a stick. It is illegal to harass an alligator and this is regulated by FWC Law Enforcement. Will alligators bite me or my dog or my children? We do not have any record of such incidents occurring and we would like to keep it that way. A great resource for answers to this question, and more related to alligators and biting, is the FWC human-alligator incident fact sheet. 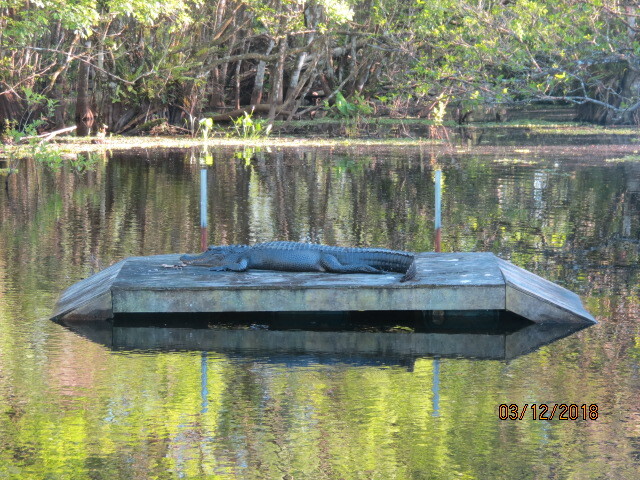 ” Be aware of the possible presence of alligators when in or near fresh or brackish water. surroundings when working or recreating near water. The likelihood of a Florida resident being seriously injured during an unprovoked alligator incident in Florida is roughly only one in 3.2 million. I do not feel comfortable with the large number of alligators at Bird Rookery Swamp. What can I do about this? One of the best things about Southwest Florida is that we have so many great places to walk and experience nature. A primitive trail system where humans are directly sharing space with native wildlife may not be for everyone, and we understand that. If you would like to increase your comfort level, we encourage you to sign up for one of our guided walks with a volunteer naturalist at Bird Rookery Swamp. 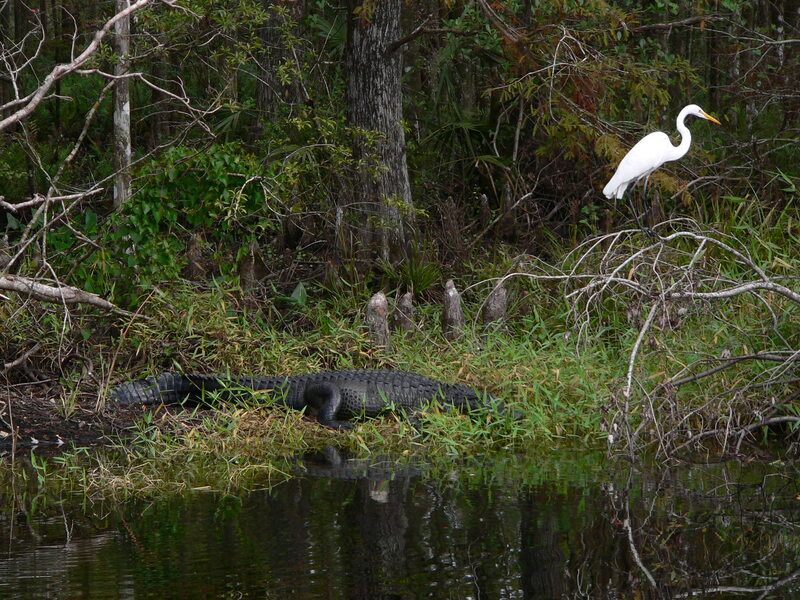 Or visit the CREW Marsh Trails or Cypress Dome Trails which have significantly less alligators. If you would prefer to hike someplace that does not share the trail directly with wildlife, we encourage you to explore other trails in the area, such as Corkscrew Swamp Sanctuary, the Gordon River Greenway and Naples Preserve. 3 Responses to "Alligators and YOU"
Don’t forgot Six Mile Cypress Slough if you want an elevated trail, as well! Absolutely! We were trying to offer Collier County options for our Bird Rookery Swamp folks. We love Six Mile Cypress!